Superior Water Tucson offers free basic water testing with fast, accurate results in most local areas. Enter your zip code to see if you qualify for free water testing! I just had my system installed. I bought my house last October and have several improvements done. All the jobs until today were stressful, with jobs not completed on time, installers not showing up, etc. I am delighted by the service I got today! Ozzy, my installer, arrived at 8 in an 8-10 window of time. He was totally prepared, obviously very familiar with his job. He had to dig up my pipe to the water main shutoff (which is not inside the house due to its age) and run piping. He had to move a cabinet to make room for the filtering device. He was unfailingly polite, was careful to explain everything to me about the systems I had installed. When Ozzy left, I had no idea where the trench had been dug and everything was cleaned up inside and out. It was like he was never here. I highly recommend Superior Water Treatment. They carry quality products and certainly use quality people to install them. Oz Vargas installed my water treatment equipment today. He was professional yet friendly. He did a beautiful job even taking out the hot water heater. He explained everything and left the area clean and neat. I certainly would recommend him. Ed K. Is an excellent salesman and Oz Vargas, an excellent installer! I’m looking forward to enjoying clean water in my home! I highly recommend Superior Water Treatment. Extremely knowledgeable sales staff that were very helpful. Our installation tech, Oz, explained the entire installation before he started. Clean, neat and great looking installation was performed. I’ve not seen customer service support at this level from very many companies like this company. Other places could learn a great deal from this entire staff. Richard - sales/demo - knowledgeable and very thorough. Answered all our questions and then some. Jeff/Val - installers - wow, what a great job. The setup for our home was less than ideal but they were able to make it work. Very clean work. Quick turn-around, even for our setup. Answered all our questions. Love the system. Couple of suggestions - on top of the sales/demo appointment, it would be helpful for the installers to look at the site and provide a real world scenario to the installation. Additionally, a post install visit would be good to test the effectiveness of the water softener.All in all, still 5/5 stars. I would highly recommend using Costco/Superior Water Treatment for demo/purchasing/installation. Oz came out to install our water refiner as well as the reverse osmosis system. He was very professional and made sure installation was perfect, even using his leveler to make the copper pipes straight. He perform the installation pretty quickly and efficiently. His soldering job was excellent. Also made sure our fridge was able to dispense the filtrated water from the reverse osmosis system. Literally the wizard of Oz. Our rep that came out was very polite and patient with us as I was very sick. He explained every test he did on our water very well. We are very happy we got the water system, can't believe we didn't do it much sooner. We have had our water system for about 19 days now and my hair is soft and amazing, my sons face is slowing clearing up. Our water system was installed within four days of our water being tested. The installers were very professional and courteous. When they broke a piece off our water pipe for the pool they jumped in and fixed it quickly and correctly. My only complaint I would have is be very careful what you sign. The way our rep explained the purchase we were under the impression we would be paying the company direct, that is very misleading and not the case. When I had time to completely review all my paperwork it’s a loan with interest. I was very upset about that because if I had known I would have put it off and save up to buy the system cash; as the interest is not for giving. I called and spoke with a manger which was not very helpful and promised a call back that I still never received. I will be paying this system off as fast as possible. We also never got our gift certificate as they promised. I informed my referrals to make sure they offer you the gift certificate they promise before they come into your home. These are the reasons I gave it four stars. Otherwise I am absolutely in love with my water system itself. Our rep that came out was very polite explained every test he did on our water very well. We are very happy we got the water system can't believe we didn't do it much sooner. My hair is amazing. My sons face is clearing up. We had our system installed within four days. The installers were very professional and courteous to our home. My only complaint I would have is be very careful what you sign. The way our rep explained the purchase we were under the impression we would be paying the company direct, that is very misleading and not the case. When I had time to completely review all my paperwork it’s a loan with interest. I was very upset about that because if I had known I would have put it off and save up to buy the system cash; as the interest is not for giving. I called and spoke with a manger which was not very helpful and promised a call back that I still never received. I will be paying this system off as fast as possible. We also never got our gift certificate as they promised. I informed my referrals to make sure they offer you the gift certificate they promise before they come into your home. These are the reasons I gave it four starts. Otherwise I am absolutely in love with my water system itself. Our rep that came out was very polite explained every test he did on our water very well. We are very happy we got the water system can't believe we didn't do it much sooner. My hair is amazing. My sons face is clearing up. We had our system installed within four days. The installers were very professional and courteous to our home. My only complaint I would have is be very careful what you sign. The way our rep explained the purchase we were under the impression we would be paying the company direct, that is very misleading and not the case. When I had time to completely review all my paperwork it’s a loan with interest. I was very upset about that because if I had known I would have put it off and save up to buy the system cash; as the interest is not for giving. I called and spoke with a manger which was not very helpful and promised a call back that I still never received. I will be paying this system off as fast as possible. This is the only reason I gave it four starts. Otherwise I am absolutely in love with my system itself. My experience from the in house demo to the install was outstanding and very professional. Danny our salesmen took the time to answer all of our questions and fully explain all of the features of the system. Our install team of Gary, Jeff, and Lindell were able to suggest proper placement of our system, power, and drainage requirements and made sure I understood the work that was going to be done prior to beginning. After the installation they went over the details for the care and maintenance of the system and made sure to answer any questions prior to departing. Such a great team to work with. I'm so glad I chose this company to install my in home system! Love the customer service this company provides. From the start when Ed came out to our house not to give us a sales pitch but prove to us how necessary this filter was needed! Not once did he mention price or try pushing us to buy anything, it was all information and how it could improve our water!! Once we were in, we had Jeff & Lyndell come by to install our filter. These guys were outstanding and had no intentions of leaving out of our home in a rush but rather take their time in installing everything correctly. They sat down and provided all the information needed and answered my questions! Thank you Superior Water Treatment staff!!! Definitely recommend this treatment from this company. Do not be scared to try it! You won’t regret!!! Jeff and Lyndell did a great job with the install. I explained our needs of where the system needed to go and they were very understanding, I explained that my husband is very particular because this is a new house. They installed the system and made sure to put the landscaping back to the way it looked originally. They explained everything to me so I could relay the information to my husband. They also brought some things to my attention that I did not know, like my system could be hooked to my refrigerator for water and ice. Originally we were told it wasn't possible. I have to say that everyone that I have encountered in the last week that works for Superior Water Treatment has been excellent. Keep up the excellent customer service!! We are very happy with the entire process using Superior Water Treatment. Jeremy came to our house and explained the filtration system in detail and answered all of our questions without hesitation. He was very knowledgeable and was not pushy at all in his presentation. Gary came and did our installation. He was excellent. Friendly, knowledgeable and got right to work. He was thorough in installing our system and even fixed a mistake previous plumbers made in our garage regarding the drain. So far the system is worth the money. The water tastes amazing. It’s too early to evaluate the effects on our skin, clothes, and faucets. I will try to remember to update the review in 3-6 months. I can’t recommend Superior Water enough, it is a great investment for our family and home. We are very pleased with the service we received from Superior Water Treatment. Our account rep, Ed, was very professional and not pushy at all. He tested our water, described the systems benefits and costs and was very patient with us. Our installer, Jeff, showed up on time and did excellent work. I was a little concerned about him drilling a hole in our granite, but he did a great job. He was professional and left the area where he was working clean. My husband also mentioned that the plumbing work he did outside, where the main system was installed, was top notch. Again, we're very happy with the service we've received and are looking forward to enjoying the benefits of our new water Ecowater system! Gary came to the house on time and provided some choices for the location of the unit. His past experience installing softeners was very valuable as he was able to explain in detail how the installation would be done at each of the possible locations, and how the price of the installation would be modified. I did not choose the easy location, but Gary, Jeff, and Lyndell stayed with it till it was completely installed that day. They were professional, happy, and dedicated. These guys are my softener guys now. I won't call any body else. Gary, Jeff and Lyndell were great at explaining all the details of the water conditioning system and offered some fantastic ideas as to placement of the conditioner, electric and other aspects of the system. We were very appreciative of all their suggestions and help in making our decisions easier for us to make. THANKS GUYS! We are sure we will enjoy our water conditioning system for years to come. Professional young men are always a blessing. Danny the salesman and Oz the installer were excellent. They were very knowledgeable and friendly. The installation process could not have been better. We are pleased with the company and with their product and service so far. Thanks for your excellence! Our installer Gary was absolutely fantastic. He was on time as scheduled and greeted us with a friendly smile. The entire process from start to finish was seamless and Gary was a complete professional the entire time. I am the type of person that likes to see the install process and understand how the system works. Gary was kind enough to allow me to hang around while he worked (within safe limits as he advised) and he fielded as many questions as I could ask while he worked. Gary’s experience and professionalism are very apparent in his attitude and workmanship and I am 100% satisfied for the work he completed. We are excited about our new water refiner and RO system and even more so happy that it was installed by Gary. Thanks again! Our installer, Oz, was awesome! We had a water softener and reverse osmosis drinking water system installed. Oz did a really nice job on the installation of both. He was professional, knowledgeable, and very customer oriented. Expectations exceeded, thanks! The technicians explained every detail of our water contaminates and the system to remove them. The under sink system made our water taste like the purest bottled water you can buy. All in all the system and the support team exceeded our expectations. Great customer service beginning with Sara. She is very professional and friendly. The installers were great. Showed up exactly on time. I had a weird setup and they did a great job problem solving. Everything is working perfectly and I would highly recommend this company. Just had installed a EcoWater water treatment system for the whole house. Jeremy came out and showed us how hard our street water was and reviewed the benefits from having our hard water treated. Less than one week later, we were scheduled for installation. OZ arrived on time and was courteous and respectful of our home. He was patient and answered all my questions. Highly recommend this company and looking forward to our clean water! Gary arrived promptly on time for our install. He was very professional and personable. He answered all of our questions and took the time to test everything and show us how to operate and maintain the system. Highly recommend him and Superior Water. Very professional and knowledgeable. The 2 workers Named Gary and Nick were very nice men. Nick did the inside work and he made it seem so easy. He did a great job drilling the hole into the granite with hardly any mess at all. Poor Gary had the outside job in 103 decree temperature digging a hole to bury are water softener 2 feet into the ground. We will be the lucky ones having soft water and great drinking water. Thank you Gary and Nick for the excellent job. See photos.Great company Superior Water. We learned about them through Costco. 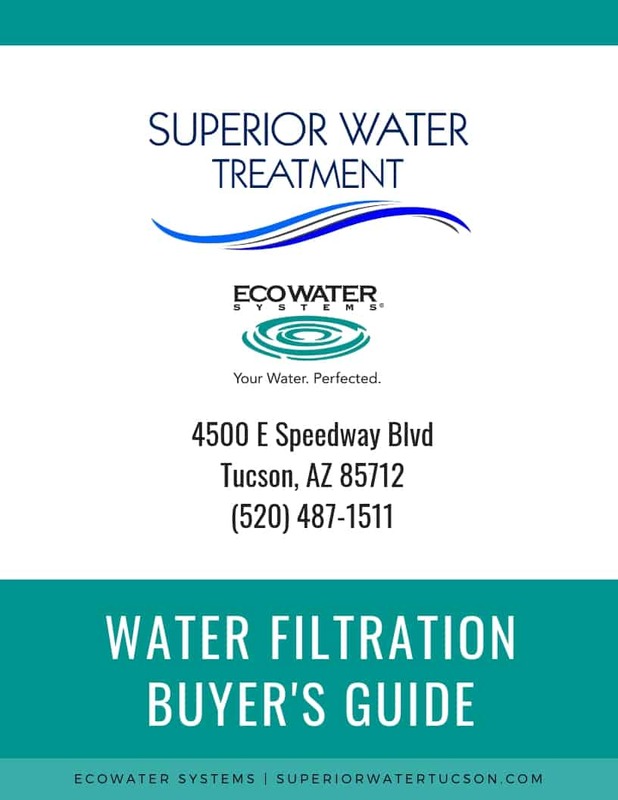 Our Free Water Filtration Buyers Guide can make sure you don’t waste thousands of dollars on the wrong water filtration system to meet your needs. Get your free guide today and get educated on the right solution for healthy water for your home and family.